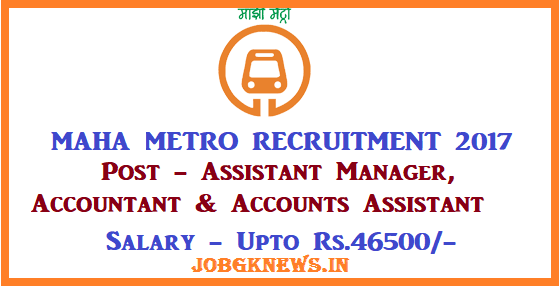 Maharashtra Metro Rail Corporation Limited (MAHA-METRO) has released a notification for the recruitment of 206 Supervised: Train Controllers/Station Operators, Section Engineers and Junior Engineers and Non-supervised: Technicians. Interested candidates may check the eligibility criteria and apply online from 10-10-2017 to 09-11-2017. For Train Controller/Station Operator :- Candidates should have passed Three-year Engineering Diploma in relevant stream from a recognised university/institute. For Section Engineer :- Candidates should have passed Four-year of Engineering Degree in relevant stream from a recognised university. For Junior Engineer :- Candidates should have passed Three-year of Engineering Diploma in relevant stream from a recognised university. For Technician :- Candidates should have passed ITI (NCVT/SCVT) in relevant stream from a recognised university. Selection Process MAHA-METRO Recruitment :- Selection of candidates will be made on the basis of Online Test, Psyhco Test and Personal Interview. Application Fee :- General/UR/OBC candidates have to pay Rs. 400 and SC/ST/Women candidates have to pay Rs. 150 through online mode using Net-banking/Credit or Debit Card. 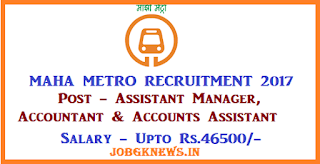 How to Apply :- Interested and eligible candidates may apply online through MAHA-METRO website - http://www.metrorailnagpur.com/ - from 10-10-2017 to 09-11-2017.